It says something about the political clout of car dealers that imported used cars appear to be the last bulwark between Australia and the right to claim a free market in the new Trans-Pacific Partnership (TPP) trade zone. The National Interest Analysis (NIA) of the Comprehensive and Progressive Agreement for Trans-Pacific Partnership tabled in Federal Parliament this week does not offer any new hard numbers on the economic value of the deal. Instead, it prefers to quote old US and Canadian think-tank forecasts. But while the analysis rightly emphasises the agreement’s broader importance in investment liberalisation, services trade, and regulatory harmony, it also contains an interesting insight into who is moving most decisively on conventional tariff cuts. It is no surprise that Singapore wins the prize for embracing goods free trade ahead of everyone else. When the agreement comes into force, probably early next year, Singapore will remove its remaining tariffs on six imported Australian products, worth $3.8 million. Australia will remove tariffs on about 3.3% of imported items over the first four years of the TPP, mostly on products such as textiles and car parts coming from Mexico and Canada – the two main countries in the group with which Australia didn’t have a trade agreement. That will leave a $12,000 tariff on used car imports as the sole remaining goods trade barrier to muscling-up to Singapore as the TPP’s real open market. This has been a regulatory minefield since the demise of the car manufacturing industry, but now stands out as even more of a test of the country’s open-trade credentials. Curiously, while Australia and New Zealand often hold their 35-year-old Closer Economic Relations (CER) agreement up as a role model to Southeast Asian countries, it will still take the Kiwis up to a decade to remove all tariffs on Australian imports as part of the TPP process. Meanwhile, it is ironic, but not so surprising, that while Japanese Prime Minister Shinzo Abe led the resuscitation of the TPP without the US, his country will be the slowest to eliminate its tariffs. After ten years, Japan will still have tariffs in place on about 5% of imports from Australia. Despite the calls for independent assessment of new trade agreements, the NIA estimates that tariff revenue loss will be $220 million over four years; however, this will be more than offset by expected higher taxes due to better economic growth generated by the TPP. It is also interesting to see that this latest formal analysis of a new trade agreement contains a lengthy section on how much public and stakeholder consultation occurred during the decade the TPP was under negotiation. The growing pressure for more accountability from business, activist groups, and even the parliament’s treaty committee itself seems to have hit a nerve. The reports of possible new aid cuts in this year’s Federal Budget only raise new questions about what sort of serious alternative to China’s Belt and Road Initiative (BRI) can be fashioned by members of the Quadrilateral group. While Japan has put money on the table in support of Abe’s idea of a better aid governance framework built on the Quad, it is hard to see much real new money flowing from the US and Australia given their fiscal circumstances. Nevertheless, the little-reported parallel decisions in China and the US in recent weeks to reshape and centralise development aid policy have only further underlined how aid-financed infrastructure is emerging as a new frontier of geopolitical competition. China’s move to establish an international development cooperation agency as part of President Xi Jinping’s government restructure has received some attention (see Denghua Zhang here). The similar move in US President Donald Trump’s budget to create a development finance institution has received less attention amid the White House’s staff turnover sagas. There are some echoes in these moves of the way Australia integrated AusAID with the Department of Foreign Affairs and Trade under the rubric of better coordination with foreign policy objectives while conveniently blurring the reality of budget cuts. 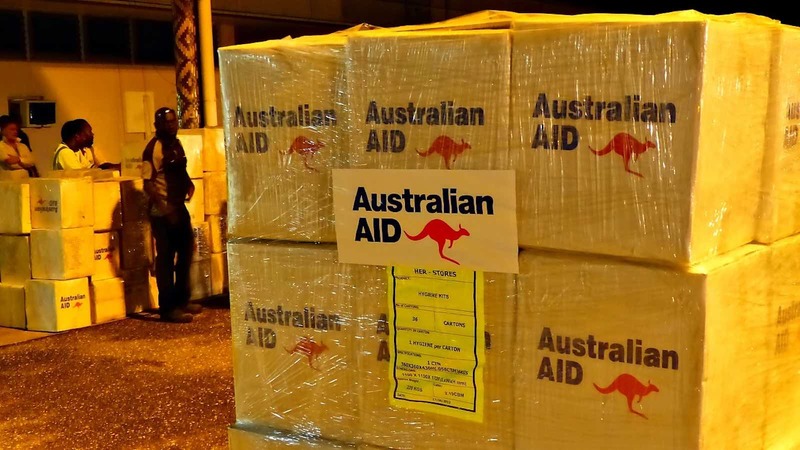 The restructure does put Australia in a better position to participate in any new regional aid governance strategy, but new cuts would raise credibility issues. The OECD’s newly released first review of the DFAT restructure reflects this tension by finding the reorganisation has fostered innovation, but hamstrung this somewhat with the cutbacks. While there are serious governance and debt sustainability issues associated with the roll-out of the BRI, there is also a growing tendency to exaggerate its size. Nevertheless, the BRI does seem to have shifted the focus of the development aid debate away from flagging Western financial commitment, in places such as Australia, to accommodating new deep-pocketed players such as China. As European Council of Foreign Relations Senior Policy Fellow Mathieu Duchâtel told this week’s Lowy Institute BRI discussion, China has now successfully managed to put a major new piece of global architecture on the table in the form of the BRI, even if many other actors don’t fully endorse it. Duchâtel argued that China does seem to at least be paying heed to some of the criticisms made about its initial Asian Infrastructure Investment Bank proposal. The recent ASEAN-Australia Special Summit elevated Vietnam as a new Australian regional interlocutor with Strategic Partner status, just in time for some new economic reform targets from the country this week on privatisation and corruption. But the summit has left some uncertainty about when exactly Australia will manage to conclude the eight-year-old negotiations on a trade deal with Indonesia. President of Indonesia Joko Widodo arrived having suggested in an interview that only technical issues remained to be resolved during the summit. Australian Trade Minister Steve Ciobo seems more cautious, his fingers burnt by the missed end-of-year deadline last year, and now only talks generally about a successful conclusion this year. Indonesian Investment Minister Tom Lembong, however, has now made Indonesian Independence Day, on 17 August, his deadline. Although by then it will be hard to know which country’s scheduled 2019 national election will be most constraining on the big shifts needed here in areas such as labour mobility and education.